The restaurant business isn’t a cakewalk. It takes fortitude, courage, determination and a willingness to explore new territories if you want to succeed. Ari Gejdenson, founder and president of Mindful Restaurant Group, is among DC’s most successful restaurateurs. 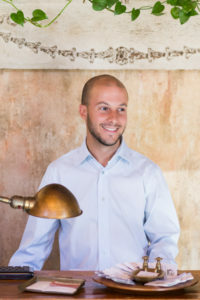 His establishments include Acqua al 2, Ghibellina, Sotto, Denson Liquor Bar, Harold Black and Ivy City’s new trio: Ari’s Diner, La Puerta Verde and Dock FC. Ari’s pioneering spirit is a trait he inherited from his Jewish ancestors. His journey, and theirs, has not always been a straightforward path. Ari’s grandparents were Holocaust survivors and his father, Sam Gejdenson, was born in a displaced persons camp in Germany. They journeyed to the United States via a loan program financed by German-Jewish philanthropist Baron Maurice de Hirsch, who resettled Jewish immigrants in Connecticut farming communities. The family settled in Bozrah, Connecticut, where they established a thriving dairy farm. Their neighbors warmly welcomed the new arrivals, and Ari says their kindness resulted in his family, in turn, becoming active contributors to their eastern Connecticut community. Read the rest of the story on the Jewish Food Experience website.